An Electronic Speed Controller is a brushless DC motor controller commonly used in model airplane, boat and car, typically sensorless. The driver circuit consists of three half bridges to generate 3-phase AC voltage over three terminals of BLDC motor. The current through motor could reach several 10s of Amperes, so MOSFETs (instead of BJTs) are used as electronic switches in a half bridge and several MOSFETs in parallel can be seen in each side of a half bridge sometimes. To drive the gate of MOSFETs, the PWM signal from microcontroller needs to be amplified both in current and voltage, often by BJT transistor circuit, as considerable amount of charge will rush in or out the gate of a MOSFET when gate voltage jumps, and sufficient gate voltage needs to be achieved to get MOSFET fully turned on. 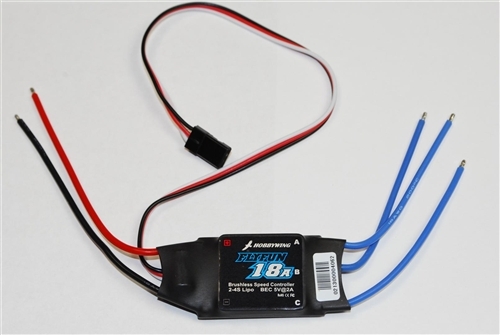 "12AE" indicates that the ESC can support current up to about 12A, which can be handled by single MOSFET in SO-8 package. 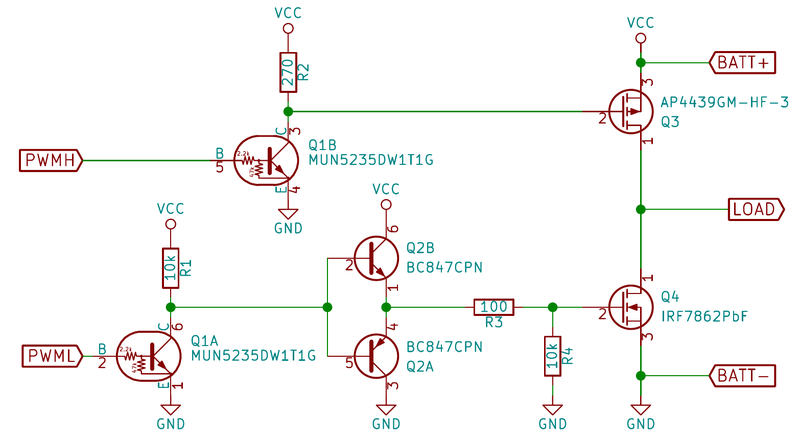 There is a MOSFET in each side of a half bridge, so 6 MOSFETs in total there are on PCB. As can be seen in the picture above, a PMOS (Q3) is used as high side switch instead of an NMOS, which is of higher performance but introduces complexity when used as a high side switch. A pair of complementary BJTs (Q2A and Q2B) are arranged in push-pull configuration, providing large enough current, to drive the gate of low side NMOS (Q4). And a pair of NPN BJTs (Q1A and Q1B, bias resistors integrated) make up 2 common-emitter circuits to amplify voltages. The output from Q1B drives the gate of PMOS (Q3) directly. To ensure fast enough voltage rise, i.e. shorter turn off time, R1 is much smaller than other pull resistors to achieve a smaller RC time constant. Driving high side PMOS via common-emitter circuit has an advantage that the PMOS is at off state when PWMH is left open as gate voltage is pulled to source. As for other resistors, R3 is placed in series between push-pull output and gate of Q4 to damp ringing and R4 pulls the gate to ground, ensuring NMOS is off by default.